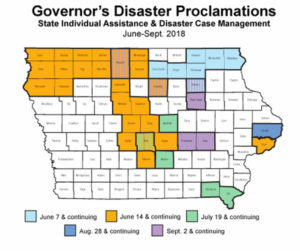 Five more counties will be added to this disaster declarations map. The governor has approved the disaster proclamation for Clinton County for storms that began on August 28th. She also approved state disaster declarations for Black Hawk, Franklin, Kossuth and Poweshiek Counties for damage associated with storms and flooding that started September second. The governor’s proclamation allows state resources to be used to help local and county governments recover from the storms. It also lets residents of those counties apply for Individual Assistance Grants up to$5,000 that are based on income and can be used to help pay for items lost in the storms or flooding. 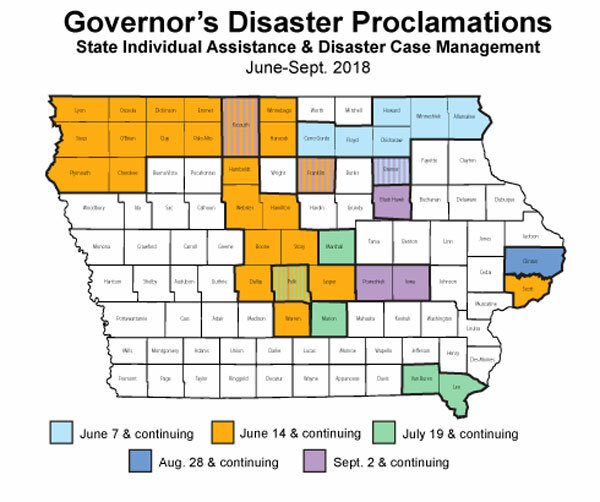 The governor earlier this week approved state disaster declarations for Bremer and Iowa counties. Forty of the state’s 99 counties have been given a state disaster declaration so far this year.